My first published short story appeared in an issue of an obscure, bi-monthly Australian publication called "This Mutant Life." The story was called "The Bank Loan" and appeared in the July 2010 issue of the magazine (you can find the publication here). I am happy to announce today that another work of mine has been published in "A Thousand Faces," the quarterly journal of superhero fiction. Ironically enough the editor of "This Mutant Life" has also placed a story in the same issue. The story in "A Thousand Faces" is called "In Memoriam," which, according to the editor, "takes you to an unforgettable funeral service for a fallen hero." This story was actually the first one I ever submitted...and the first one accepted. That makes the achievement of having it earn the "Editor's Choice Award" even more satisfying. Below you'll find the cover for the Autumn 2010 edition of "A Thousand Faces." Clicking on it will take you to the main website. 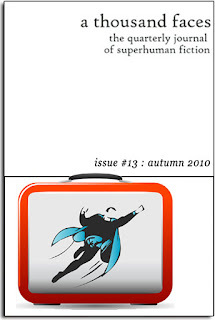 Once there, you'll need to click on the issue again to get to the table of contents. You can find the story indexed under the "fiction" section on the left side. Or...you could just make it really easy on yourself and click here to go directly to the story). Three other short stories of mine have been accepted for publication. One is due out very soon in an upcoming issue of "This Mutant Life," another is due out next year in another edition of "A Thousand Faces," and a third has just been accepted for an anthology of superhero stories due out...well...I'm guessing next year.